I received an email with these words just a month ago. "You have sown many many seeds into kids’ hearts. God will help these seeds grow and bear fruit in the hearts of the next generation. Please also give a heart-felt 'Thank you' to all the people who support of your ministry." The ladies of Hacienda Heights show us their journals with 400+ days in the Bible! This is year 44 for The MrJ Band. The casts of this children’s theater troupe have performed in front of more than 250,000 children, and powerfully shared our Savior with them. The MrJ Band will bring this year's theme, There's A Monster under My Bed, to thousands of kids this summer. We developed this show immediately following the events September 11, 2001, and boys and girls need God's light in their lives just as much today. "Kurt, I consider my gifts to The MrJ Band to absolutely one of my best financial investments. Your young cast members shine "God's light" on children who long for God's light in a very dark world. " I write to you to ask you to help our ministry compensate these talented and committed young artists. We are not in a financial position to provide that compensation without your help. We have young people with faith beyond their years. We have a cast with talent that will engage and excite young children. The Holy Spirit is going to use these teens and young adults big time! Today I ask you, the reader, to become an ongoing ministry partner with The MrJ Band through monthly giving. We simply cannot fund this mentoring of young people any longer without your help. Many of you are, or have been, faithful donors to this work. I want to thank you for your support. But today I am asking you to begin, restart, or increase your giving to MrJ Ministries. I cannot soften my request in these times. Our ministry to these young cast members has increased and expanded many fold. We are rich with God’s best serving on our team, but we do not have the funds to support these gifted road warriors. **NOTE: Praise report! Last summer the giving of our support team completely covered our payroll expenses. It was amazing. And I prayerfully ask if you could join us and meet this need again. Join us shine God's light into the lives of young children and their families! You will receive a giving record at the end of this year. Pray for the cast members whom God will use to reach thousands this summer. Pray for life-change in our audiences. AND add extra prayers for life-change right here in the lives of our cast. Shining God's light into the lives of young children and their families! 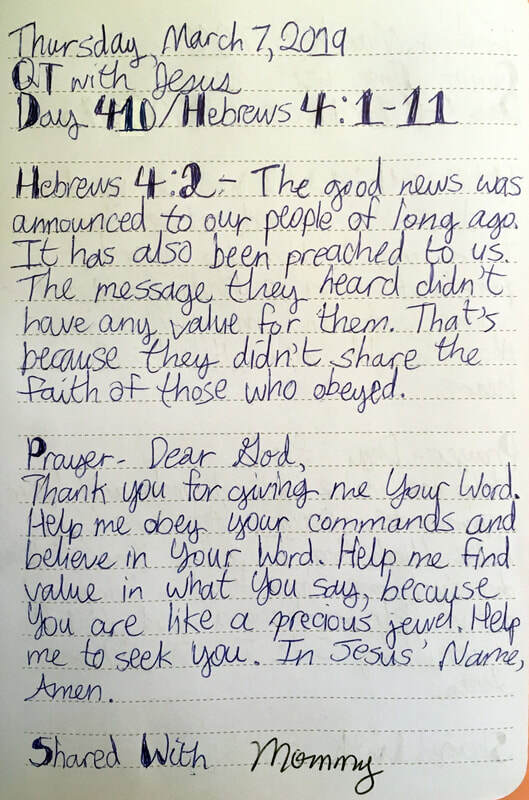 ↓READ BELOW↓ — One of the pages from a young girls Quiet Time journal during her 400+ days in the Bible. Wowza!! !